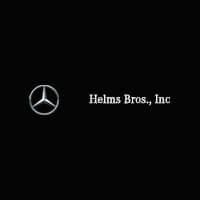 Helms Bros. Service Experts provide you and your vehicle every tool at our disposal to ensure your vehicle performs the way it did when you first hit the road. Following the manufacturer guidelines specific to your vehicle helps give the peace of mind that you’re running at peak performance, extending the life of your vehicle, and preventing major costly repairs down the road. For your convenience, you can call or schedule service online based on your schedule, not ours. Contact our Service Center for more information or to let us know how we can help you. ^ Required brake flush additional $179.99. **Service costs listed only represent estimates and may not match actual repair cost. Repair and maintenance costs vary depending on your vehicles year, model, age, and mileage. Speak with one of our service specialists for specific information regarding your Mercedes-Benz vehicle. †Price advertised for Service A/Service B includes all factory-required components. Please refer to your maintenance booklet for the complete list of factory-required services and details on the specific intervals for your vehicle’s year and model. MY09-newer.